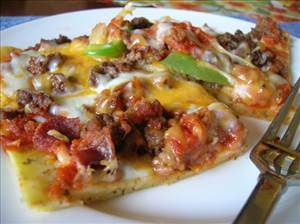 Homemade pizza crust with tasty toppings. Preheat oven to 205 °C. Grease and flour a pizza pan or 10x15 baking sheet (with sides). Combine flour, salt, oregano, pepper, eggs and milk and mix well. Pour batter in pan and tilt pan around until bottom of pan is evenly coated. Sprinkle the cooked meat, onions and mushrooms over the batter. Bake for 20 minutes. Remove from oven and drizzle on pizza sauce. Sprinkle evenly with cheese. Bake for about 5 more minutes, or until cheese is bubbling. Slice and serve. 15 members have added this recipe to their cookbook. Ideal for sandwiches or pizza. There are 357 calories in 1 serving of Crazy Crust Pizza. Calorie Breakdown: 47% fat, 22% carbs, 31% prot.